Kiss Army Argentina fick en exklusiv intervju med Chris K. Lendt, synd bara att den är på spanska men jag har översatt den med hjälp av Google till engelska. 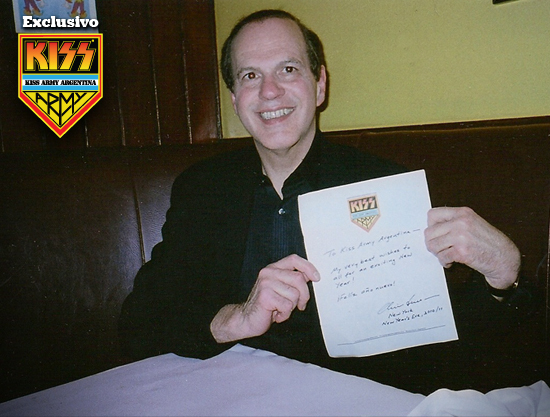 Chris K. Lendt was part of the Kisstoria almost from the earliest times. Having entered Glickman / Marks Management Corp. in 1976, over the years became nothing more and nothing less, the man who took the place of the legendary Bill Aucoin in 1982 and thereafter managed businesses to Kiss 1988. Personal experiences and professional experiences with the world’s hottest Banda credited as the best way to not miss a letter of everything you have told us in this new exclusive interview with Kiss Army Argentina by Marcelo Ferreyra and Diego Garcia. Hi Chris, a pleasure to do this interview with you. You’ve had a long history connected with KISS and is inevitable for us to play that side of your career, as you can imagine. You graduated from the University of Southern California in 1975 in Entertainment, Telecommunications and Business Administration and for 1976 were in some way working near KISS is it true? Yes, I graduated with a degree in Telecommunications in 1973 and immediately began the career of business administration, also at the University of Southern California, got a master in that area in 1975. After living in Los Angeles for a few months back the New York area, where I am from. A year later I started working for KISS and I joined them on tour with Destroyer. Can you tell us how it all started? How did you start working with KISS and what your responsibility in the organization Glickman / Marks? I answered an ad in the New York Times. A company called Glickman / Marks Management Corp. had begun to serve as managers shortly before trading KISS. They were looking for a young person as an account executive, to officiate as a link between the company and its new customers, who were the members of KISS. I was interviewed by Howard Marks, Carl Glickman, and finally, Bill Aucoin. At first my responsibilities were not well defined. In Glickman / Marks Management wanted someone to travel with the band to be their eyes and ears. They wanted to know how money was spent on the road, how they managed the box office receipts and the band could maintain contact with the representative of the commercial manager. After a few months one of the staff of the tour put me as your nickname ”The Presence” [The Presence]. What did you know about KISS at the time to start working with them? Not much. I had heard of them, and I knew they used makeup and costumes, but that was it. What was your relationship with the members of KISS then? Do you saw every day? Yes, we were daily. We took the same flight, we sat in adjoining seats on airplanes, traveled in the same car, we remained in the same hotels, and we looked at all shows. I always felt I had a very good relationship with everyone in the band. While traveling together, it was my job as an assistant staff or tour manager. It was clear that my role was strictly business and finance, and ultimately became its business manager for the tour. How does the organization KISS in the early years? How was the division of responsibilities between Bill Aucoin and Glickman / Marks? Glickman / Marks Management was responsible for the traditional functions of a business manager, such as raising money, paying bills, analyze royalty reports and make up accounting issues, managing the finances on the road, preparing budgets, business strategies for band and overall financial strategies. Aucoin Management dealt with the marketing, promotion, publicity, arrangements for recording in general studies and creative strategies for the band. You worked for KISS as vice president of Glickman / Marks Management Corp. and also went Banda commercial manager for long. You’ve traveled thousands of miles with them, have visited over 25 countries and has seen about 800 concerts … All that experience really deserved to be in a book as you wrote (”Kiss And Sell ”)… How much data you have collected in such detail for so long? pay much attention! I was fascinated by the world in which I was immersed, and had many memories I wanted to keep. Always pay attention to detail, and I have good memories, which I found helpful in school. And through my years with KISS was closely involved in its affairs. I was the man of the details for the company, and was daily not only with the band but also with their lawyers, accountants, promoters, record executives, talent agents, etc. Contracts, memos, letters and other documents in general went through my hands. KISS is without doubt one of the bands that more merchandise and commercial products has been in history and probably will not have been left out of decisions about such things. Can you tell us how were these meetings which discussed new businesses or products to KISS? It happened very quickly. When the band went through a great time in the late 70s, came to Aucoin proposals all the time. Most typically referred to merchandise such as toys, dolls, clothes, posters, etc. Pinball machines [also known as flippers. N. the T: its origins date back to the fifteenth century] were unusual in that it did not constitute a mass market in which the units are sold in large quantities. In fact, became one of the most popular collectible items and are a symbol of the success of KISS. In fact, only produced a small amount of equipment (can not remember exactly how many). I was involved more closely with business conducted with 20th Century Fox in 1980. We signed an agreement with Fox at the beginning of his success with Star Wars. All KISS merchandise would be left to Fox licensing agent KISS, which held approval rights. Have you ever been in complete disagreement with some commercial elections Banda? What would you have done differently? In retrospect, some of the merchandise was too childish, and damaging the image of the band as a hard rock band at that time. Were tainted by the money they obtained quickly. Few of the agreements that were rejected. As a result, they lost credibility with many fans of that era. Sure, most bands today have that kind of merchandise. Maybe in KISS were ahead of their time. The commercial exploitation of music artists is now much more accepted. I also believe that ”The Elder” was a mistake. KISS The public was not interested in an album with moody and mystical air rock opera style. After the failure of the album, KISS’s career has plummeted for several years. We read that during your years with KISS you had a closer relationship with Peter Criss What Peter was so special to you closer to him? Peter grew up in the harsh world of Canarsie, a neighborhood in Brooklyn, New York. It was high school dropout but I knew handled in the streets. Peter had several odd jobs in the early stages of his life, and worked as a musician since his teens. He had a very colorful personality, wild and crazy, and sometimes volatile. It was also very good at telling stories. He loved to talk, and I was a very attentive listener. My upbringing had been different: I grew up in a wealthy suburb, and spent my youth studying at the university. My behavior was more reserved. But opposites attract. We shared a passion for travel, good restaurants and what Peter called ”the good life.” That kind of chemistry is given in stronger relationships. Is that true stories that scared or worried Peter who worked with him? Which is exactly what I did? Yes Peter’s behavior had become a threat to KISS in the late ’70s. Was getting out of control. Peter had drug abuse problems that make it unstable, erratic and problematic. He had a great emotional strain, and sought professional help. He felt he could no longer work with Gene and Paul and continue touring with them. Shortly after the band stopped and began planning a solo career. And how was your relationship with Paul, Gene and Ace? I always felt we had a cordial relationship. Ace had a bad temper at times, but this was due in part to his drinking problems and the like. Paul was sometimes a bit arrogant and temperamental. Gene could be very bossy and pompous. But almost all of my experiences with them were nice and rare exceptions, we seemed to get along. After the departure of Bill Aucoin do you imagine that he would succeed or was something that came as a surprise? No, I never imagined as the successor to Bill. Glickman / Marks Management took over the majority of oversight and management functions that had been in the hands of Bill. Gene and Paul were in charge of creative affairs. Fortunately for me, had a key role in organizing KISS as a kind of chief operating officer for commercial affairs. There is a chapter in your book ”Kiss And Sell” in which you focus on Diana Ross, and once you have declared that the appearance of Diana in the life of Gene has somehow made an impact in the life of KISS. What particular memories of those days? If it were not for Gene’s relationship with Diana Ross, we would not have changed their business managers. While not last long, were involved in key decisions in the career of Diana. Negotiate his contract with RCA Records and major international and local tour [U.S.] in which he embarked in the early ’80s. On a personal level, Gene and Diana seemed to be madly in love. Unlike his previous romantic relationships, this time it was a woman known and great achievements, not a groupie unknown. Your book was published at the height of the return of the 4 original, like other publications, but among the fans, ”Kiss And Sell” has always been considered a major publication because of the detail that tells …. Some issues certainly did not like Gene and Paul, have you received a phone call from them about those in the book? No, never received any call or comment or KISS or their representatives. What do you remember the time when Peter left the band? What was going on internally in the Banda and how to cope with problems from the business side? Peter was struggling to build a solo career. He had a record deal with Phonogram International for this company is committed to producing a disc, which basically was released in Europe but not in the U.S.. His solo career never took off. By the early ’80s, he had sold his home in Connecticut and moved to the area of Los Angeles. After that, virtually lost contact with him. Then came Eric Carr .. What can you say about him? Eric was a great musician who energize the band when he played drums. He was a very pleasant character and bearable, and a team player. I also had some trouble understanding what exactly his role in KISS and how was your relationship with Gene and Paul. It was not surprising then that he felt the shadow of both. Eric joined KISS as a complete unknown when she was a supergroup KISS. That adjustment would have been equally difficult for everyone. What was the best time you lived with KISS, working for them? Imagine that among so much work and so many activities and responsibilities you’ve lived with them … fun times Do you remember any in particular? Some of the funniest situations occurring while traveling. During the tour of Canada in 1977, rented a Convair plane [N. the T: I understand that jet] that seemed to have a few mechanical problems. On one occasion, co-pilot allowed the security guard Gene take his place in the controls. Someone shouted to Gene: ”Hey, Gene, look who is driving the plane!”. Gene could see the guard behind the controls in the cabin, and stood as if about to have a heart attack. For starters, Gene hated flying, and terrified of small planes. As for Peter, during the Dynasty tour in 1979, the airport was always wrapped in blankets and hugging a pillow. I was exhausted from having stayed awake for days. It had to be brought on board as an invalid. The scene was really strange, especially to see the reaction of other passengers. Did you share a lot of free time on tour with KISS and they were on one side and business people on the other? Yes, no doubt. During the early years often went together to the movies, bowling, restaurants, shopping malls, clubs, and sometimes to see shows of other artists. As I discuss in my book, I traveled with Peter and his [then] wife Lydia to Hong Kong, Bangkok and Singapore. In the area of New York, visited the other members of the band at home on many occasions, for parties and meetings. On one occasion I was in the house of Mrs. Florence Lubowski, the mother of Gene, for a Passover Seder dinner [marks the beginning of the Passover]. I remember attending many parties and dinners where the hosts were the members of KISS, his record company, Bill Aucoin, Howard Marks, Carl Glickman or others in his circle. What changed things internally in KISS when Ace and Peter left the band? How does that change the way of doing business for KISS? With the departure of Peter and Ace were removed much of the friction and uncertainty. The band became Gene and Paul and two hired musicians. Were much more focused and disciplined. Everything was more oriented to business. The creative chemistry was not the same, but have not made these changes, it is difficult to think that KISS would have continued. How is living on in the band during the recording of Creatures Of The Night? How many guitarists saw drop by the studio? Most of the album was recorded in LA, and I was not personally present at these meetings. From what I heard, they were hard pressed to find a replacement quickly. Vinnie was a great guitarist and composer. He also made many choirs. But he never seemed satisfied with their situation. Gene and Paul as restricted, what bothered Vinnie. Soon, Vinnie made a number of lawsuits in which claims to have been deceived by the royalties on her as a composer. That’s really complicated things, and was the beginning of the end for Vinnie. You may remember the failed attempt to visit Argentina in 1983 KISS What can you tell that missed visit? How are negotiations conducted? I raise this issue in detail in the book. We were dealing with an employer who really had no experience in staging a show of the magnitude of KISS. It was successful as a theatrical producer in Argentina but had neither the organization nor the capital to produce stage shows for a rock band of great magnitude. At that time also there were too many obstacles in their way, referring to the government [N. of T.: Argentina returned to democratic system of government in late 1983 after nearly 10 years of military dictatorship], such as exchange control, bureaucracy and political instability [N. the T: during the dictatorship, the military command is followed different], and also lack of production, lighting equipment, sound and scene. It ended up being a venture too risky. After working many years for KISS, can you tell us what things you rescue your criteria for each of its members? Paul and Gene are survivors. Persevered during difficult times. And they were always willing to take great risks to move forward. They are without doubt two of the most dedicated people I know. Paul was the most artistic. He had a good eye for art and design, and talent for music and to play. Gene was creative and a commercial basis at the same time, which was a unique combination. He was always fascinated by the commercial potential of creative endeavors. Peter was a very sociable and livable, that in his prime could connect with people emotionally. Ace has always represented the most ”party animal” and more free-spirited in the band. You worked for KISS to 1988, is this accurate? Why did you leave? I worked for KISS to 1988. My company, Glickman / Marks Management, was fired as manager of business management in 1988. KISS engaged in a series of lawsuits against the company (not against me), that were resolved in 1990. Howard Marks died suddenly of a heart attack and Carl Glickman reached a financial agreement with the band. By then, the company had already closed their doors, and KISS manager Jesse Hilsen was Dr, Paul’s psychiatrist. There was no place for me. What is your vision of KISS now? Have you heard Sonic Boom? I’m not really a follower of the band. Two current members are people who do not know. I think I heard a song by Sonic Boom. Like most rock bands, their songs and music features that define emerged in the early stages of his career. Really admire the fact that Gene and Paul have been established and continue to tour as one of the world’s most successful bands. Do you have plans to publish a sequel to ”Kiss And Sell”? Material you will probably have to spare! No. I think the book is very thorough with my story and what was the KISS phenomenon at its peak. What took the other members of KISS during the 80’s that Gene was always aware of its interests in producing movies or bands? Does this create some discomfort, especially Paul, who was primarily responsible for keeping KISS alive in those years? Paul thought that Gene was trying to do too much to take so many outside projects, such as acting in film and producing bands. At the same time, Paul probably would have wanted to do some of those things. He tried to act in films and producing bands, but Gene was devoted to these issues in a much more resolute and firm. What happened when you stopped working with the band? Were you contact them? Surely when you edit your book there will have been some contact with the band, right? No. My only contact with KISS since then was a phone call from Gene to 1995. I had heard that I was writing a book and was curious about it. I told him it was the music business, but gave no details. We talked a few minutes, and that was it. ”Kiss and Sell” was published about two years after that. What you do today? ”He teaches? Yes, I am an associate professor in marketing at the University of New York since the 90s. I am also a consultant for companies and artists in the area of media and entertainment, and manage my own investments. Do you have any unfinished business left in life? Something I’ve wanted to achieve and still have not got? greatly enjoyed my years with KISS. It was a defining period in my career, and certainly some of the best times of my life. I can never repeat that experience. Only time will tell if I do something that is equally rewarding. Can you devote a few words to KISS Army Argentina? In KISS are very fortunate to have devoted fans worldwide, including Argentina. Your support has made it possible to meet KISS and playing around the world again. And personally, I visited Buenos Aires on two occasions, most recently in 2001, and is one of my favorite cities. Chris has been a pleasure. Thank you very much for your kindness and your time. A special thanks to Chris K. Lendt, for their tremendous kindness, warmth and professionalism to give us this exclusive interview and send material so interesting. Interview by Marcelo Garcia and Diego Ferreyra for Kiss Army Argentina. Translation of the interview: Mariana I. Abello ”MIA” for Kiss Army Argentina.